I think that all of you realize that we are the generation of which Christ spoke about in Matthew 24:34, when there will be deceived “if possible, even the elect” (Mt 24:24). I think you realize that we are in the time of the great apostasy of which St. Paul wrote about (2Thess 2). Thus if even the elect can be deceived, we must pray much and make many sacrifices and stay close to the Sacraments as Our Lady of Fatima asked us to do, but also to struggle to not lose the unchangeable Truth in this time of great confusion especially in the Church. THE FUNDAMENTAL AND EASIER WAY that leads gently, and even with dancing and enjoyment, TO HELL is: “Ignorance is bliss”! See also in the Diary of Saint Faustina, no. 153, 741. I do not think it was by chance that when Pope John Paul II was asked toward the end of his life to offer one verse from the entire Bible for the people of God, he responded without hesitation: “THE TRUTH SHALL SET YOU FREE” (Jn 8:32; Jer 6:16)! Father, “Sanctify them in the truth” (Jn 17:17)! The Truth, tied to the cross of Jesus here on earth, is uncomfortable, and thus discarded by many especially today! How can one live the Our Father, “Thy will be done”, when one avoids seeking to discover what this will is, in particular for Catholics, to confront one’s life with the Catechism of the Catholic Church for adults (ed. 1992), not just with the Sacred Scriptures which are very often interpreted in the manner of comfortable subjectivism and relativism without the indispensable cross of Christ?!? “Error is being taught and propagated beneath the ambiguous formulas of a new cultural interpretation of truth; the spirit of the world finds welcome; it spreads its malignant influence and leads so many souls to accept sin, to justify it and to live in it; loss of faith is becoming a deluge, and in many places of worship the images of the saints have been removed, even those of your heavenly Mother” (August 26, 1983). “The cause of such a vast diffusion of errors and of this great apostasy rests with UNFAITHFUL PASTORS. They remain silent when they should speak with courage to condemn error and to defend the truth. They do not intervene when they should be unmasking the rapacious wolves who, hidden beneath the clothing of lambs, have insinuated themselves into the flock of Christ. They are mute dogs who allow their flocks to be torn to pieces” (September 8, 1985). “This Masonic infiltration, in the interior of the Church, was already foretold to you by me at Fatima, when I announced to you that Satan would enter in even to the SUMMIT of the Church. If the task of Masonry is to lead souls to perdition, bringing them to the worship of false divinities, the task of ecclesiastical Masonry on the other hand is that of destroying Christ and his Church, building a new idol, namely a false christ and a false church. (…) Jesus is the Truth because it is He - the living Word - who is the font and seal of all divine revelation. And so ecclesiastical Masonry works to obscure His divine Word, by means of natural and rational interpretations and, in the attempt to make it more understandable and acceptable, empties it of all its supernatural content. Thus errors are spread in every part of the Catholic Church itself. 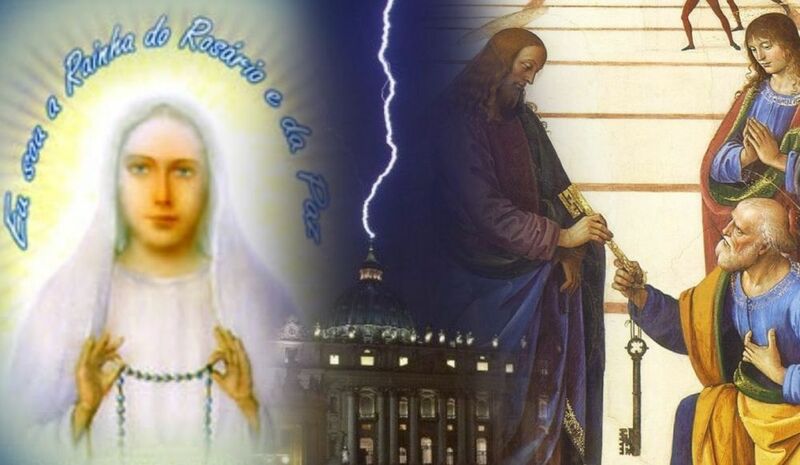 Because of the spread of these errors, many are moving away today from the true faith, bringing to fulfillment the prophecy which was given to you by me at Fatima: `The times will come when many will lose the true faith.' The loss of the faith is apostasy. Ecclesiastical Masonry works, in a subtle and diabolical way, to lead all into apostasy” (June 13, 1989). a "Beloved children, take refuge in my Immaculate Heart. b The glorious reign of Christ will be preceded by a great suffering which will serve to purify the Church and the world and to lead them to their complete renewal. c Jesus has already begun his merciful work of renewal with the Church, his Spouse. d Various signs indicate to you that the time of purification has come for the Church: the first of these is the confusion which reigns there. This in fact is the time of its greatest confusion. e Confusion is spreading within the Church, where everything in the field of dogma, liturgy and discipline is being subverted. f These include truths revealed by my Son and which the Church has defined once and for all, through her divine and infallible authority. g These truths are unchangeable, as the very truth of God is unchangeable. Many of these form part of real mysteries in the strict sense of the word, because they are not and never can be understood by human intelligence. h Man must accept them with humility, by an act of pure faith and firm trust in God who has revealed them and proposed them to men of all times, through the Magisterium of the Church. i But now there is spread abroad a most dangerous tendency of wanting to penetrate and understand everything even mysteries to such a point that only that part of the truth is accepted which can be understood by human intelligence. There is a desire to unveil the very mystery of God. j Any truth which is not understood by reason is rejected. There is an inclination to propose all revealed truth in a new and rationalistic way, under the illusion of making it acceptable to all. k Thus truth is being corrupted with error. Error is being spread in a most dangerous way, namely, as a new and modern way of understanding the truth, and it ends by subverting the very truths which are the foundation of the Catholic faith. l They are not denied openly, but they are accepted in such an equivocal way that doctrine is most seriously compromised by error in an unprecedented manner. m As a result, talk and discussion go on and on; but there is no longer any belief, and the darkness of error spreads. n The confusion which tends to prevail within the Church and to subvert its truths is the first sign which indicates to you with certainty that the time of her purification has come. o The Church is in fact Christ who is living mystically in your midst. p Christ is the Truth. The Church must therefore always shine with the light of Christ who is the Truth. q But at present, its Adversary has succeeded, through his subtle and deceitful works, in bringing much darkness into its interior. r And today the Church is darkened by the smoke of Satan. s Satan has first of all bedimmed the understanding and the thinking of many of my children, seducing them through vainglory and pride, and through them he has darkened the Church. r You, beloved sons of your heavenly Mother, you, the apostles of my Immaculate Heart, are being called today for this purpose: to fight by word and example that the truth may be more and more accepted by all. Thus the darkness of confusion will be defeated by the light. u For this reason, you must live the Gospel of my Son Jesus to the letter. v You must be, purely and simply, the living Gospel. Then you must proclaim to all, with strength and courage, the Gospel which you live. Your words will have the power of the Holy Spirit who will fill you and the light of the wisdom given you by your heavenly Mother. For this, the more the confusion, having entered inside of the Church, the greater the suffering of her purification will increase, the more She, by means of you, will experience the comfort and help of my maternal action. By you the Church will be helped to come out of the darkness, in order to be born again into the divine splendor of her immutable Truth. Saint Francis prophesied: “very few Christians will want to obey the true Sovereign Pontiff and the Roman Church with a sincere heart and perfect charity”. It comes to mind the great rebellion against “Humanae Vitae” (1968) which reaffirmed the constant teaching of the Church that it is a grave mortal sin to use contraception! “Rome will lose the faith and will become the seat of the Antichrist” – Our Lady of La Salette (1846). The cover image of this group is the Lord’s Prayer. Hopefully this group is to help people not just to SAY the Our Father, to give “lip service” to God, but to LIVE the Our Father: “THY will be done”, not “MY will be done”. Years ago, the second question of the Catholic Catechism for children was: “Why did God create you?” As children we responded: “To know, to love and to serve God and to be happy with God in heaven forever.” For a great number of Catholics and Christians today, religion exists to serve oneself, not to “serve God”, not to help us discover God’s holy will for each of us and to help us live God’s holy will which is the best thing for each of us, since God loves us. But to do God’s will, we must say no everyday to our egoism with the help of God’s grace through prayer (especially the Holy Rosary) and the Holy Sacraments, especially the Sacraments of Reconciliation and the Most Holy Eucharist. Throughout the centuries of human existence, God has revealed His saving Truth, which makes us free” (Jn 8:32); we call this Divine Revelation. God sent His Son Jesus who founded a Church, the Catholic Church, to guide us in interpreting Divine Revelation according to God, not according to the very numerous opinions of men and women, who are very often not inspired by pure love of God and neighbor, nor by true humility. Divine Revelation has been written down, with the guidance of the Holy Spirit for 2000 years, in the documents of the Church, and well summarized in the Catechism of the Catholic Church for adults (CCC; ed. 1992, promulgated by Pope John Paul II; http://www.vatican.va/archive/ENG0015/_INDEX.HTM). If we need to clarify the Truth in a world more full of falsehoods than ever before - beautiful deadly lies from “the father of lies” (Jn 8:44) presented as if they were the truth, hidden destructive deceptions (such as the devil, hell and sin no longer exist!!! ), misguided compassion and half truths (which are worse than lies! ), especially to speak only about mercy without “Go and sin no more” (Jn 8:11; 5:14) - we can go to the CCC. But the main focus of this group is to LIVE these precious and saving truths in our daily lives so as to help each other become true saints in faith, hope, charity and true humility, so as to arrive one day to “What no eye has seen, nor ear heard, nor the heart of man conceived, what God has prepared for those who love Him” (1Cor 2:9)! 1. Are you Catholic or do you want to know more about the Catholic Church? 2. Are you seeking to discover God's holy will for you and to try to live His holy Will, or is religion something that exists to serve only what you want? After the two parts which I have already explained, at the left of Our Lady and a little above, we saw an Angel with a flaming sword in his left hand; flashing, it gave out flames that looked as though they would set the world on fire; but they died out in contact with the splendor that Our Lady radiated towards him from her right hand: pointing to the earth with his right hand, the Angel cried out in a loud voice: ‘Penance, Penance, Penance!'. And we saw in an immense light that is God: ‘something similar to how people appear in a mirror when they pass in front of it' a Bishop dressed in White ‘we had the impression that it was the Holy Father'. Other Bishops, Priests, men and women Religious going up a steep mountain, at the top of which there was a big Cross of rough-hewn trunks as of a cork-tree with the bark; before reaching there the Holy Father passed through a big city half in ruins and half trembling with halting step, afflicted with pain and sorrow, he prayed for the souls of the corpses he met on his way; having reached the top of the mountain, on his knees at the foot of the big Cross he was killed by a group of soldiers who fired bullets and arrows at him, and in the same way there died one after another the other Bishops, Priests, men and women Religious, and various lay people of different ranks and positions. Beneath the two arms of the Cross there were two Angels each with a crystal aspersorium in his hand, in which they gathered up the blood of the Martyrs and with it sprinkled the souls that were making their way to God.” (Tuy, Spain; 01-03-1944). Pope St. Pius X (1903-14) had two visions that were similar to the Fatima Vision of Sister Lucy. In 1909, in the midst of an audience with members of the Franciscan order, he seemed to fall into a trance. Moments passed, then his eyes sprung open and he jumped to his feet. "What I have seen is terrifying!” he cried out. “Will I be the one, or will it be a successor? I saw the Pope flee from the Vatican passing over the dead bodies of his priests.” Later, on his death bed, but still clear-headed, another vision came to him and he spoke: "I have seen one of my successors, of the SAME NAME, who was fleeing over the bodies of his brethren. He will take refuge in some hiding place; but after a brief respite, he will die a cruel death. Respect for God has disappeared from human hearts. They wish to efface even God's memory. This perversity is nothing less than the beginning of the last days of the world." The name being referred to is not the papal name – Pius or Benedict – but rather the baptismal name. The baptismal name of Pope St. Pius X is Giuseppe (Joseph in English) Melchiorre Sarto; the baptismal name of Pope Benedict XVI is Joseph Ratzinger. Saint Peter returns the keys to Jesus! And we must be always prepared, as if – Our Lady said – the last days of our life: in the grace of God, receiving the Eucharist, confessing always and asking for the light of the Holy Spirit. And I said in Amazzonia, before the altar of your house, kiss the pavement three times and ask: “Lord, that I may never loose my faith in the moments of difficult trials that will arrive soon in the world” (…)” (http://cibo-spir.blogspot.it/2018/03/email-bloccate-controllo-del-nom.html). Glauber affirmed that with the death of Benedict XVI the devil will go wild. The Freemasons are afraid of the Truth of God which “will sets you free” truly (Jn 8:32). Thus the Freemasons are afraid of people who know what’s going on and are respected by many people in the world and especially in the Church which is the primary target to be destroyed (“The Masonic Plan For The Destruction Of The Catholic Church”; http://spir-food.blogspot.it/2013/11/masonic-plan.html). Hitler burned many books and killed a great number of professors who were not in agreement with him! If Hitler was seeking the truth and the will of God, Hitler would have been willing to dialogue with those not in agreement with him in order to seek the truth and the solution together which comes from God, not from Hitler nor from another person! Why did “Pope Francis” refuse to dialogue with the four cardinals (and other bishops) who wrote the “Dubia” regarding the very grave problems with “Amoris Laetitia”, and now with Cardinal Viganò regarding the silence about known homosexual activity among high ranking clergy??? (http://spir-food.blogspot.it/2018/02/soon-oath-of-blind-obedience-to.html). If two Catholic people realize and accept that the Truth comes from God, they will be willing to dialogue while making reference to Divine Revelation well expressed in the doctrines of the Church. But if one of them is attached to his own idea and believes that he has all the Truth, then he is not willing to dialogue or allow anyone to show him how his words or writings are not in harmony with the doctrines of the Church. Does the Truth comes from God or from the Church? Is the Church the handmaid of the Truth or the author of the Truth?!? As St. Augustine and St. Thomas Aquinas explains to us, St. Peter was willing to listen to St. Paul at the first council of the Church in Jerusalem (Acts 15)! The Holy Spirit is the Soul of the Church and the Church is the soul of the world. The Eucharist is “the source and summit of the Christian life”.” (Vat. II: LG 11; CCC 1324), as well as for the Church, the Body of Christ. So as to move more quickly to manipulate the Church toward their goals, there might be a real possibility that the Freemasons will eliminate Pope Benedict, using any one of their financed terrorist groups. After Pope Benedict will be eliminated, I believe there will be “Soon Oath of Blind Obedience to Bergoglio” (http://spir-food.blogspot.it/2018/02/soon-oath-of-blind-obedience-to.html), in preparation to take away the Most Holy Eucharist in all the public Catholic churches in the world by way of a mandatory invalid ecumenical mass, “The Abomination of Desolation” (http://spir-food.blogspot.it/2018/04/the-abomination-of-desolation.html). Many bishops have given their Imprimatur to this book. You will find in these messages of Our Lady revealed through Don Stefano Gobbi a resemblance to the writings of Saint Louis de Montfort, Saint Therese of the Child Jesus and to the messages of Our Lady of Fatima, with the sweetness that only the Mother of God, and the Mother of each us, could communicate to those open to the caresses of Our Lady! (http://our-lady-priests.blogspot.it/). “The Polish Pope had indicated to Don Stefano Gobbi the way to contact him directly, by way of his Secretary Mons. Stanislaw Dziwisz, in his name. … One day Pope John Paul II said to Don Stefano Gobbi, pointing his finger at him: “You are pastor of the whole world”.” “July 1 (2011), solemnity of the Sacred Heart of Jesus, Cardinal Ivan Dias being with the Holy Father, informed him of the death of Don Stefano and of the Holy Mass celebrated the day before at Collevalenza. Pope Benedict XVI, after a brief pause of silence, pronounced these words: “He went straight to heaven”. (“Pastor of the Whole World – Biography of Don Stefano Gobbi” (“Parroco di Tutto il Mondo – Biografia di Don Stefano Gobbi”), by Mariadele Tavazzi; San Paolo, 2015; pp. 181, 200). Just as Our Lady cannot tell us everything, so too there are many things that the saints know from God but it is not the will of God to reveal certain things; but at times Our Lady, as do the saints, gives us rather revealing indications. Don Stefano Gobbi, June 12, 2011, about two weeks before his death, said to Padre Quartilio Gabrielli and to another priest (sitting close together), that in this message there is summarized all that we are living now. What is in preparation is so extraordinary that it’s like has never happened since the creation of the world. That is why everything has already been predicted in the Bible. The terrible struggle between me, the Woman Clothed with the Sun, and the Red Dragon, Satan, who has now succeeded in seducing many even with the error of Marxist atheism, has already been foretold to you. The struggle between the angels together with my children and the followers of the dragon led by the rebellious angels has already been foretold to you. Above all, my complete victory has already been clearly foretold. You, my sons, have been called to live through these events. It is now the time for you to know this, that you may be consciously prepared for the battle. This is now the time for me to begin disclosing part of my plan. Dear friends, let us strive to be part of “one third shall be left” that in this period will pass “through fire” “as silver is refined, test it as gold is tested” so as to rest eternally with our loving Creator where “eye has seen, nor ear heard, nor the heart of man conceived, what God has prepared for those who love him” (1Cor 2:9; Is 64:3; Jer 3:16)!!! No pain no gain; no cross no crown. “I WILL STRIKE THE SHEPHERD, and the sheep will be completely scattered”. I believe that this passage is referring to what the Prophecy of St. Francis of Assisi explained in greater detail; “Nostro Signore Gesù Cristo invierà loro non un degno pastore, ma uno sterminatore”! The following is a couple of emails from a woman “very torn” here in Italy who is part of the MARIAN MOVEMENT OF PRIESTS (MMP), along with my reply. The Subject of her email is: “The silence of the Marian Movement of Priests”. Since the MMP is so important to Our Lady, I spent some time in gathering information which regards the problems and the division in the MMP after the death of Don Stefano Gobbi. I tried also to indicate the danger for suffering Catholics, with their eyes open in this period of great confusion in the Catholic Church, to follow a priest of Palermo (Italy), Don Alessandro Minutella, given that there are very few priests and bishops in the Church and in the MMP today who have the courage to protect the souls entrusted to them from the beautiful lies and traps of the wolf, of Satan, who is very present in the Catholic Church today!